After choosing and adding an item to your bag, please proceed to the checkout page. Next choose the Checkout Securely option. Enter your delivery details and proceed to the Order Summary. Choose the V12 Retail Finance option and proceed to the Payment screen - You will then be transferred to the V12 Retail Finance application portal where your application can be completed. 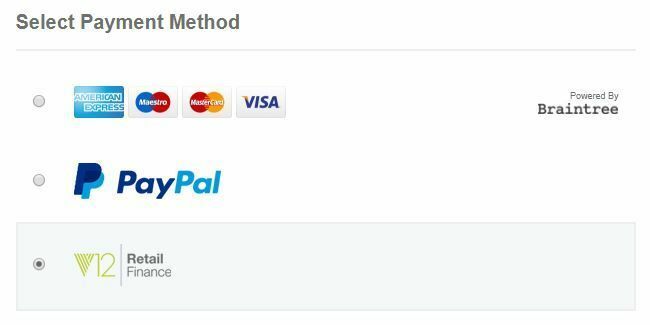 Once the application is accepted and agreement received, a PayPal money request will be sent via email for payment of the required deposit. Who is my finance with? Our finance scheme is provided by V12 Retail Finance. You can choose a 6, 9, or 12 month loan repayment period with our Interest Free Finance payment option. In most cases you will know immediately if your application has been accepted or declined, however, credit applications can be referred and if this is the case you will be notified as soon as a decision has been reached. Can I have my order delivered to somewhere other than my home address? To safeguard applications, orders that are being paid for by finance can only be delivered to your home address.